Lucius Domitius Aurelianus was born of humble parents at Sirmium sometime between 207 and 215 AD most likely on September 9th, 214 AD. Aurelian adopted a military career, and by his skill, courage and bodily strength he ultimately became one of the Empire’s greatest generals of the 3rd century. Aurelian’s reputation as a commander of the cavalry was perhaps his greatest strength. During the siege of Mediolanum (Milan), Aurelian became embroiled with Marcus Claudius (Claudius Gothicus) in an imperial intrigue. Gallienus was murdered, and Claudius Gothicus became Emperor, with Aurelian serving as Master of the Horse. A series of campaigns against the Goths followed, but in January 270 AD, Claudius died of the plague in Sirmium. His brother Quintillus aspired to the throne, but Aurelian gained support of the army and was elevated to the throne over Quintillus, who later killed himself. The state of the Roman Empire was deplorable at the time when Aurelian came to power. The barbarian hoards were threatening the frontiers across much of the north. The usurpers had virtually divided the Roman world with Tetricus on the Rhine at the head of a Gaulish Empire begun under Postumous andZenobia, the Queen of Palmyra, stood in the East with various generals and pretenders in her camp. Aurelian began his restoration of the Empire by marching first against the Germanic Juthungi, who had invaded the province of Baetia and thus threatened Italy. Aurelian forced the barbarians into a retreat and routed them on the Danube. The Juthungi sued for peace, and Aurelian allowed them to return home. Aurelian then headed for Rome, where he received the imperial powers from a rather reluctant Senate. Shortly thereafter, Aurelian received an urgent request from the province of Pannonia, where the Vandalswere on the attack. Aurelian responded quickly by crushing them in 270 – 271 AD. Once again, the German Juthungi threatened Rome but this time they allied themselves with the Alamanni and the Marcomanni. The tribes ambushed Aurelian near Placentia, defeating him and forcing a retreat into northern Italy. However, the Germans were too disorganized to follow up on their victory, and Aurelian used the time to rebuild his defenses on the north. He marched against the Germans a second time and this time virtually exterminated them all. Aurelian returned to Rome in 271 AD, where he had to pacify a terrified city. He immediately halted the rioting and restored order to the capital. The controller of the mint in Rome began a rebellion over the monetary reforms laid out by Aurelian. He ordered that all the debased currency be purchased back and replaced with a new currency of higher content in silver. The rebellion was led by Felicissimus. It appears that those who had been running the mint were embezzling the intended silver and issuing the debased coinage at least in part on their own authority. Obviously, any reform to the monetary system that called for an increase in silver content would have been unprofitable for those running the mint for personal gain. In the rebellion, as many as 7,000 soldiers died when Aurelian was forced to trap and execute them and their allies, some of senatorial rank, in a terrible battle on the Caelian Hills. The barbarian invasions had made a profound impact upon Rome. It was the first time they saw their city as being vulnerable. Aurelian thus commissioned new defense walls (the Aurelian Walls) to encircle Rome itself, although they were not fully completed until the reign of Probus. Nonetheless, these are the great walls of Rome that still remain largely intact today. Aurelian then turned his attention to Thrace, which had been invaded by the Goths. Aurelian invaded with his usual determination and reconquered the region while chasing the Goths back over the Danube. Aurelian realized that the imperial frontiers were proving impossible to defend, and as a result, the province of Dacia, the conquest of Trajan, was entirely abandoned. With the northern frontiers reestablished, Aurelian then turned his attention to the Palmyrene Queen, Zenobia. A battle near the Orontes River ended the revolt of Palmyra. Then, in 274 AD, Aurelian turned his attention this time towards the usurper state – the Gallo-Roman Empire of Postumous. Aurelian marched into Gaul to attack the usurper Tetricus and his Gallic supporters. At the battle near Chalons, Tetricus abandoned his troops and surrendered. The Empire had been pacified, and Aurelian could at last look forward to a splendid triumph in Rome. Both Queen Zenobia of Palmyra and Tetricus, former Emperor of the Gallo-Roman usurper state, appeared as captives in the magnificent triumph which the Emperor celebrated in Rome where at last senatorial resistance to his position finally disappeared. With the Roman Empire restored and military conquests complete, Aurelian turned his attention to the domestic reform issues of the state. The currency of the Empire had been severely reduced in value, plagued by countless debasements one on top of the other. The once silver denarius had been replaced by the double denarius of Caracalla (Antoninianus) and that had been reduced to a mere bronze shell of its former glory. The continued debasements had caused massive inflation, and the Empire would not survive without also restoring the monetary system. Aurelian’s reforms did not end with the monetary system. He also attempted to end the social and moral decay that had festered amid such poor economic conditions. Aurelian sought to somehow unify society as a way to accomplish this so he also tried to reform religion. From the East, Aurelian tried to encourage religious devotion to the sun god, Sol Invictus. His goal was to develop a universal deity that would unite the pagan world. In the process he began the persecution of the Christians once again in an effort to create social unity. Aurelian had one last goal in mind so with his domestic reforms accomplished, or underway, he returned to the East during the summer of 275 AD with a glorious ambition for the conquest of Mesopotamia. Always the disciplinarian, Aurelian caught his secretary, Eros, in a lie during the campaign and promised dire punishment. Eros, fearing the worst, went to the Praetorian Guards and told them that Aurelian was planning to kill them as well. In an effort to save his own skin, Eros began a plot which proved to be successful. Aurelian, at the age of 68, was assassinated at Caenophruriun in Thrace and Rome lost not merely one of its greatest generals, but a man truly worthy to have occupied the throne of the Roman Empire. Mints: Rome; Vienna (? ); Lugdunum; Milan; Ticinum; Siscia; Serdica; Cyzicus; Antioch; Tripolis; unidentified mint. Early during his reign, Aurelian carried out a monetary reform which was quite extensive. 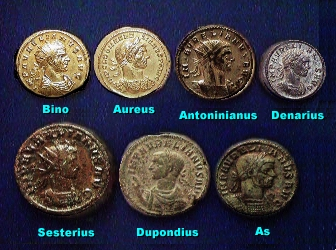 He increased the size and weight of the antoninianii and there appears to have been a major improvement in the technique of applying the silver wash to the bronze coins. No attempt was made, however, to reintroduce a silver coin. A mark of value (XXI in the west or KA in the east) was also placed on most of the new antoninianii – but not all. While some have argued that this is a tarrid marking suggesting that 20 antoninianii were equal to one gold aureus, it seems unlikely, given the massive inflation of the period, that such a high value could have been place on a simple base coin. It is more likely that these markings refer to the silver content being 1/20th. In other words, while a full restoration of a silver coinage was not possible, it was possible to add the scarce silver to the antoninianii thus increasing its alloy value by making it 1/20th silver. 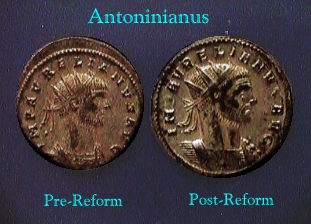 The monetary reform of Aurelian also saw the reestablishment of denarii, sestertii and asses for the first time in decades. The dupondii, which had traditionally been distinguished from the As metal content, may have been distinguished by portrait style as was the case between the denarii and antoninianii. The dupondii tend to be about the same size as the As but much thicker. The portrait style is to the left with the Emperor raising his hand and holding a globe. This design continued briefly and appears to have been abandoned by Diocletian. The average weight of the aurei was also increased from 5.54 grams to 6.50 grams and a Double Aureus (Bino), displaying a radiate portrait of the Emperor, was also struck in much greater quantity than ever before with an average weight of 8.25 grams.